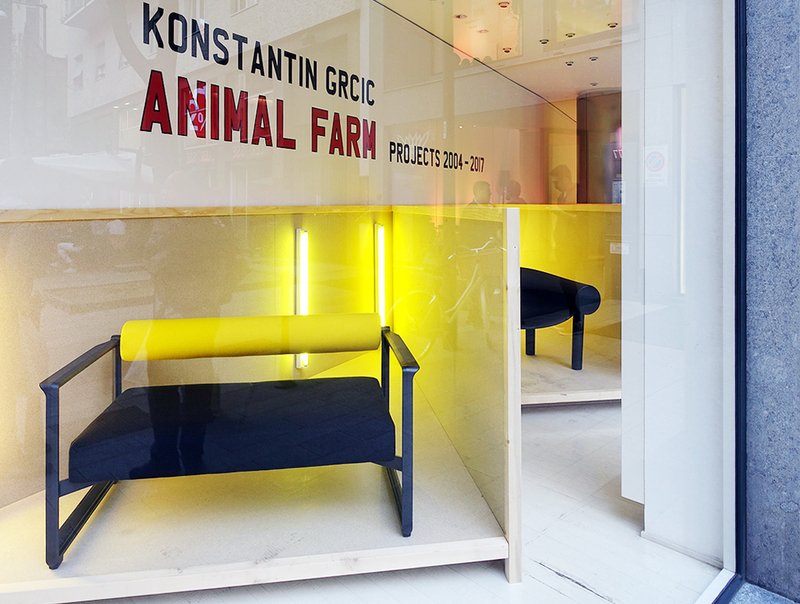 Under the sign of the mule: In the Magis showroom on Corso Garibaldi there was a small exhibition celebrating Konstantin Grcic entitled “Animal Farm”. The Salone del Mobile is a febrile matter that is potentially infectious. 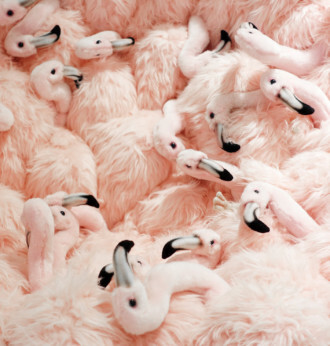 Hardly has the curtain been lifted than thousands of images of thousands of furniture items are doing the rounds. Anyone who does not succeed in immediately grabbing everyone’s attention with his or her project has not a chance of infecting others with the right fever. This does not mean the sober gets excluded; on the contrary: In the colorful variety show, the sober not only cuts a “bella figura”, but also demonstrates the difference. Admittedly, here no one stands outside history, and that includes the designers. 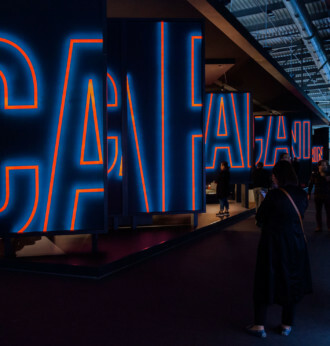 Their designs, and this all too easily gets forgotten, are not only influenced by fashions, new currents or swiftly announced trends, they are also part of the general history of design with all its ruptures, twists, turns and revivals. In order to be able to duly place the new it first, however, needs to be grasped and categorized. 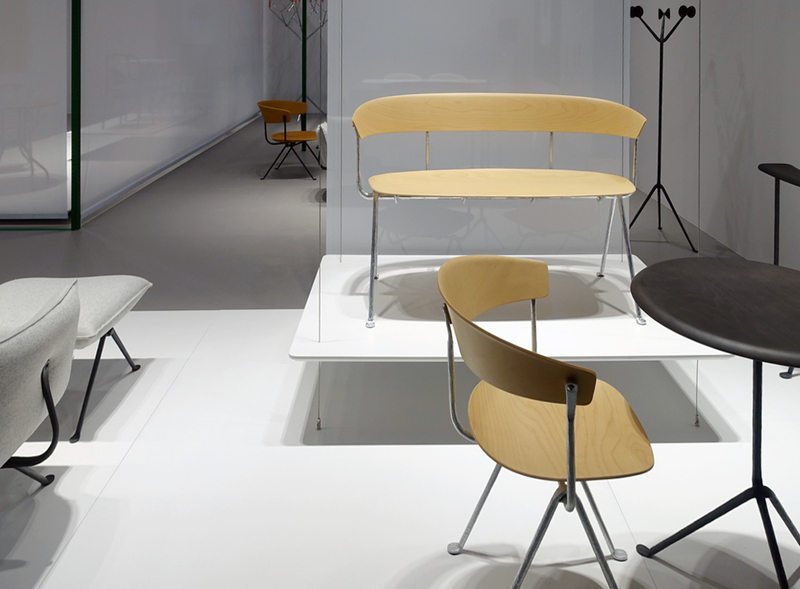 Rolf Fehlbaum, the keen mind behind Vitra, once said on the occasion of an exhibition about Jean Prouvé, that while the designs by Charles and Ray Eames possessed a “vivacious lightness”, the works by the French specialist with bent sheet metal stood out for their “vivacious heaviness”. For all the quite overwhelming wealth of a trade fair, with more or less appealing chairs, tables and settees, with frames of wood or plastic, this contrast has not vanished, but retains its strong relevance even in an age of all manner of nomadic phantasies. 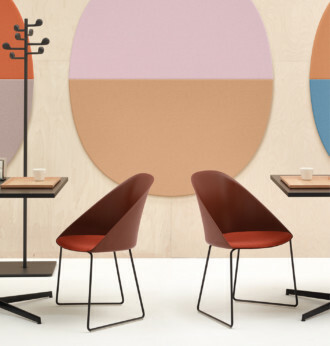 As is revealed at this year’s Salone in quite exemplary fashion by two new products, the one by Konstantin Grcic, the other by Jasper Morrison. Konstantin Grcic has expanded his “Brut” collection for Magis which would not in itself hardly bear mentioning as manufacturers nowadays tend to play a set of furniture through in all possible versions of the particular vocabulary. At the factual level, the Brut family, which launched last year with tables and benches, now includes a sofa with a cast iron frame; the seat and backrest are upholstered and have fabric covers. 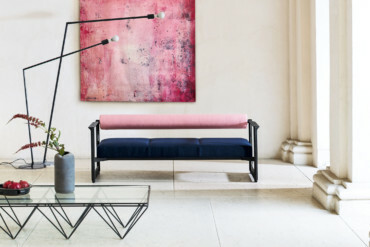 However, and first and foremost, this newly presented “Brut” sofa testifies to a certain change in furniture design that bears closer scrutiny. Like the other family members, the sofa’s load-bearing frame is decidedly heavy, robust and sturdy. At first glance it already indicates something that hardly seems to be part of the agenda today: soundness and durability. While things mutate, on the one hand, into images of themselves or (of late by means of bulky Virtual-Reality specs that transpose the wearer into artificial worlds as if they were divers on the ocean floor) on the other dissolve completely into data flows, here it is above all one thing that gets emphasized: material reality. Alone by dint of its pure weight the sofa seems to contradict the trend that anything and everything today must be constantly mobile and mutable. Konstantin Grcic thus once again proves to be an “homme d’usine”, to be a factory man, but by no means in some nostalgic sense of the word that looks backwards in time. 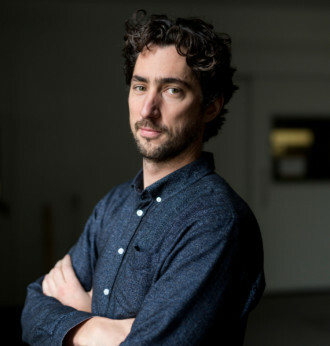 This time he again develops new ideas by relying on elements of technological, design and cultural history in order to rethink them in the context of the contemporary world and its advanced production techniques. “The project’s starting point,” or so Konstantin Grcic himself describes things, “was a special manufacturing process, the way cast iron can be worked, a material with two key properties: It is hard and it is heavy. Cast iron is fairly resilient when it comes to compression and is therefore a preferred material for bridge building and, which has more to do with furniture, for the base frames of heavy machinery.” He goes on to say that cast iron’s special nature as a “heavy, uncompromising material” that is now being brought to bear in modern furniture making. What counts are the details: The transition from the side section to the backrest for the new settee in the “Brut” collection. The elegantly shaped side sections give the sofa a truly refined look. Grcic is never concerned with an object’s façade and this distinguishes him from many of his contemporaries, and is much in evidence here, too. 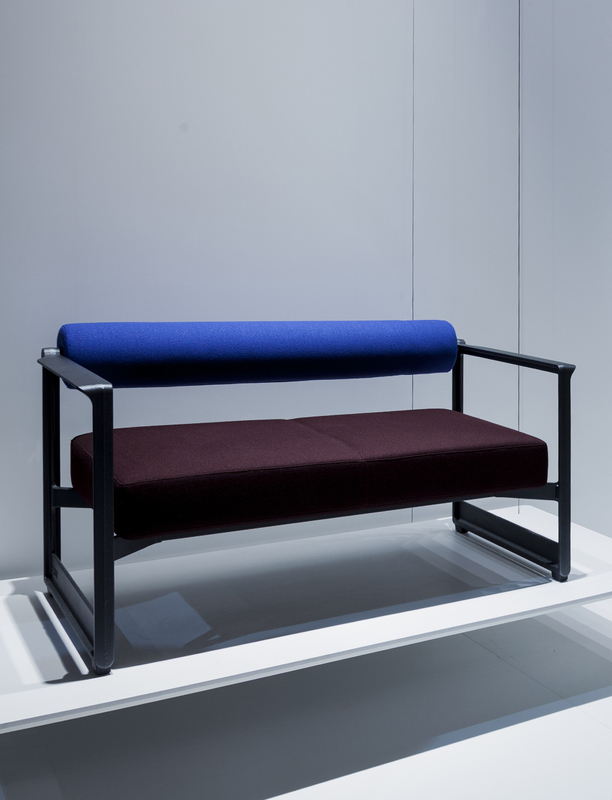 As was the case with his legendary “Chair One” (now available in new colors), with his cast-iron sofa he also starts from the material’s properties. Its sheer weight is, as it were, dialectically overcome in the seating area, which seems to float in the frame, and by the slender upholstered roll of a backrest. Like Prouvé, with “Brut” Grcic starts by thinking through the structure of the load-bearing elements, the backbone. The robust plasticity may initially have technical reasons, on the back of a post-modern that is losing itself in a pluralism of shapes and colors, but it transforms it into a down-to-earth modernism, which through the mythology of iron remains intrinsically bound up with an imagination of labor. Grcic counters the massive feel vivaciously with not only the different colors of the upholstery but also the precisely shaped details of the side sections, the armrests and the links to the backrest, by avoiding planar surfaces. In this way, the name “Brut” stands not only for the solidity of a worked material. 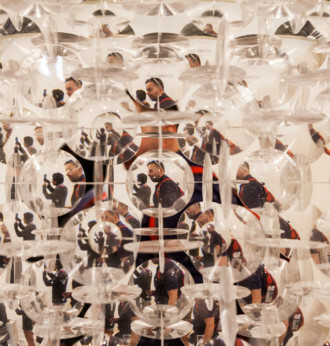 For in this way, and Grcic himself knows this, the whole is also reminiscent of “the grace of a sparkling wine”. 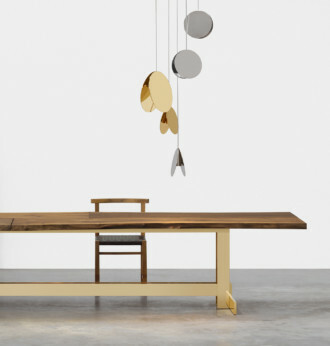 While Ronan and Erwan Bouroullec more strongly emphasize the hand-crafted quality of forged iron in their “Officina” collection for Magis, which has likewise now been expanded, Grcic once again consistently plugs an industrial aesthetic the change in which he not only participates in, but also vivaciously enjoys. 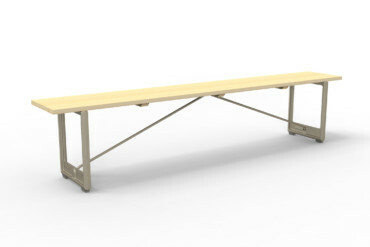 Well thought through, and light: The frame for Jasper Morrison’s “1-inch” chair on show at the Emeco trade-fair booth. It is a bit banal to remind the reader that design was never just a matter of form. While Konstantin Grcic upholds iron structures, Jasper Morrison pursues a quite different, but essentially no less logical approach. 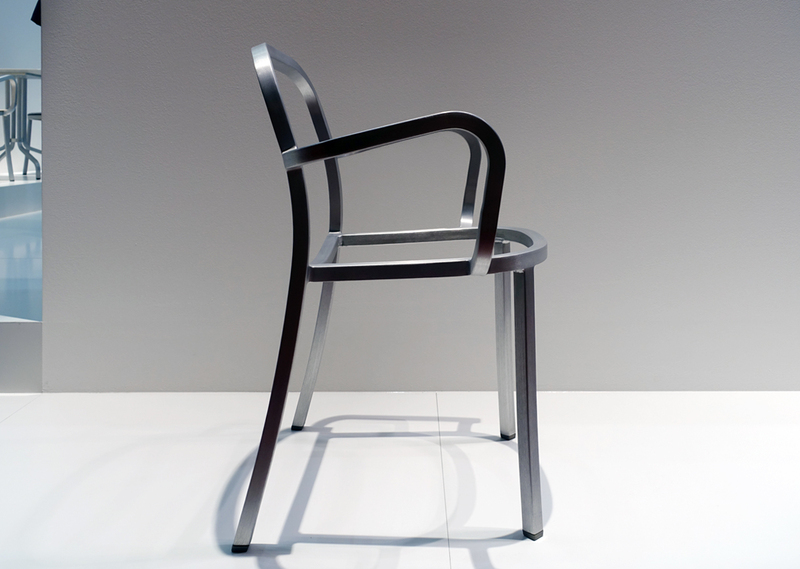 To that end he makes use of a no less magical material in industrial history, namely aluminum. 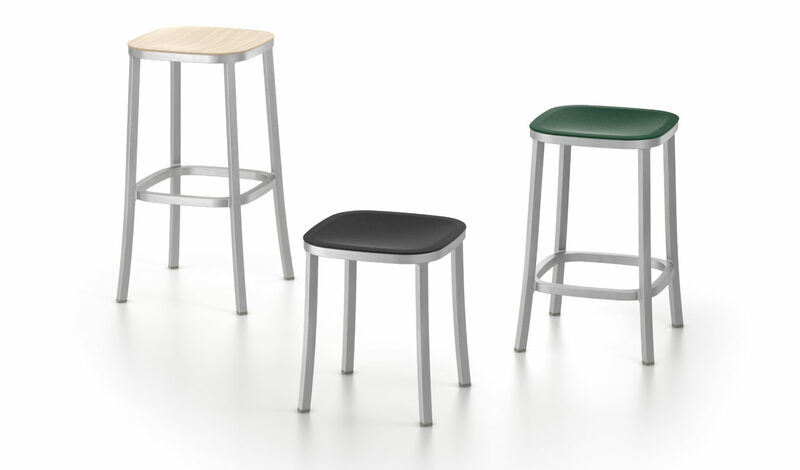 Together with US aluminum specialist Emeco he has launched a “1-inch collection” that makes use of recycled aluminum to forge a family of seats that embraces a chair (with or without armrests), a stool in three different heights, as well as café and bar tables. Morrison likewise consciously explores the limits of things. He chose a 1-inch square extruded aluminum tube, that delivers maximum rigidity for minimum material. 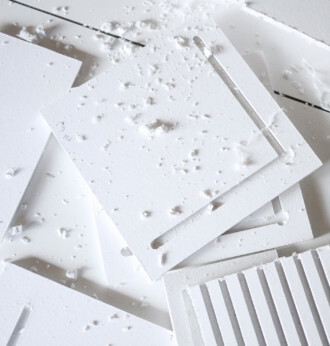 Word has it the choice caused the craftsmen at Emeco many a headache when building the frames. The result is a chair that is as well thought through as it is attractively slender, with material qualities that likewise signal sustainability and solidity, but unlike “Brut” not heaviness but lightness. 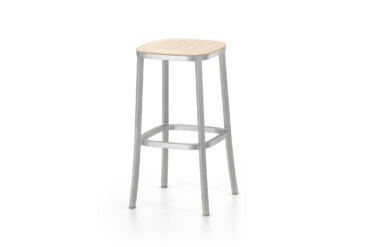 Family bonds: Jasper Morrison’s “1-inch” collection also includes three stools of different heights. Anyone who lifted the raw “1-inch” frame into the air on the Emeco booth knows immediately what its chief quality is. 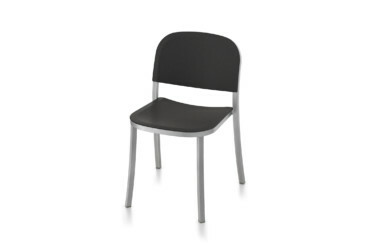 Recycled, eco-friendly materials are used not just for the frame: The seats and backrests consist either of a recycled polypropylene/wood mixture (on offer in 7 colors), or, in the plywood versions, made of ash or walnut from sustainably forested parts of North America. 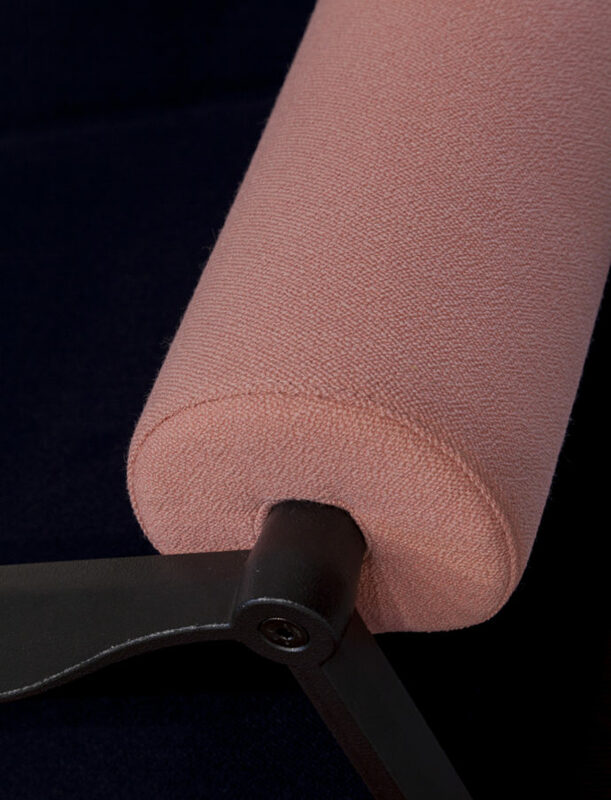 In addition, there are upholstered versions with fabric or leather covers. 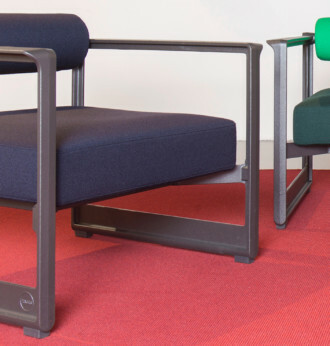 Heavy or light, the designs by Grcic and Morrison signal not only solidity and durability, but also update the ethic of designing in line with the materials, which otherwise seemed almost to have been forgotten. 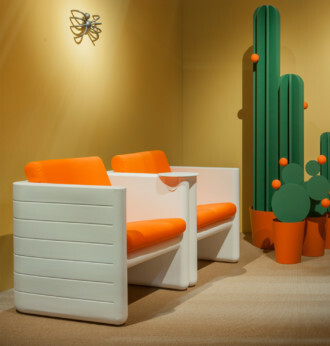 As regards the contrast between “vivacious gravity” and “vivacious lightness”, this was by no means as readily apparent as regards the other designs presented in Milan, although a hesitant return to visually lighter furniture was to be noted here and there. For example with the new “Arcos” program that Lievore Altherr developed for Arper which also alludes to visualizations of transformed historical role models (for all the structural differences, remember the zest emanating from the legs in Mies van der Rohe’s 1930-1 Brno chair). Other variants, hardly surprisingly, come from Japan, where Naoto Fukasawa and once again Jasper Morrison have tried out a quite different and somewhat more conventional form of vivacious lightness. Seems light in a different way: Lievore Altherr's “Arcos” program for Arper. Solid craftsmanship: The expanded “Officina” program by the Bouroullec brothers on display at the Magis trade-fair booth. The whirlwind of new products blinds the eye to the true innovations. These are now taking place in the field of recycled materials. Velvet, fringes, cushions and love seats galore: The current sofas and easy chairs are ideal for creating a cozy lounge. Well stored: Where to put all your things? 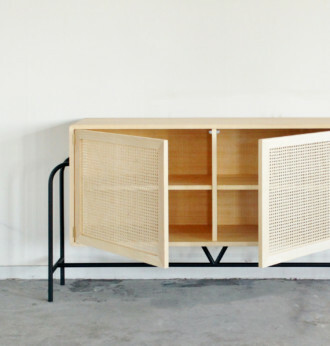 Whether proudly presenting or skillfully concealing their contents, the new bureaus, sideboards and shelf units at the Milan Furniture Fair deserve our complete attention. Be they short or long of leg, simply unique or extravagant: there’s no end to the variety of tables in Milan. Off we go! 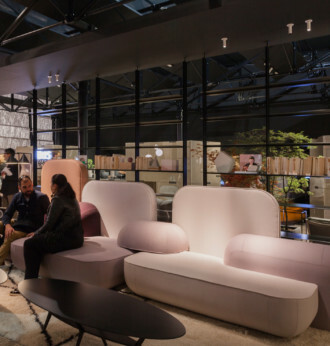 Take a walk with us through trade-fair fairyland, catch the mood at the one or other booth and a glimpse of the novelties at this year’s Salone del Mobile. 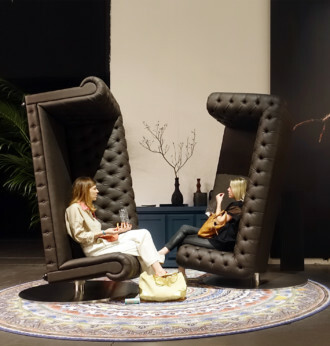 You did not make it to the Salone del Mobile? Don't worry! 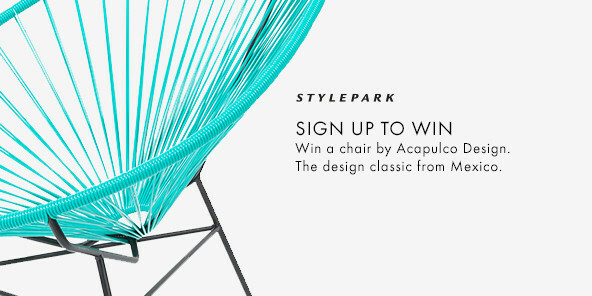 Stylepark delivers you fresh impressions from the design hotspots in Milan every day. In Milan, MINI LIVING is exploring contemporary forms of living with a confined footprint. 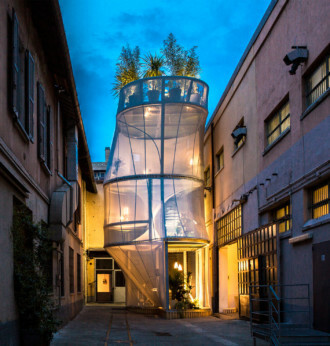 The “Breathe” installation, devised in collaboration with New York architects SO - IL in a Milan inner courtyard, provides space for up to three people, developing new urban space for occupation. Furniture, luminaires, glass, porcelain, bathroom ceramics, loudspeakers – Cecilie Manz is a past master of the entire design spectrum. 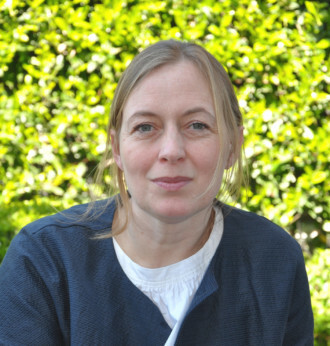 Uta Abendroth spoke to the Danish maestra about her outdoor furniture for Gloster. 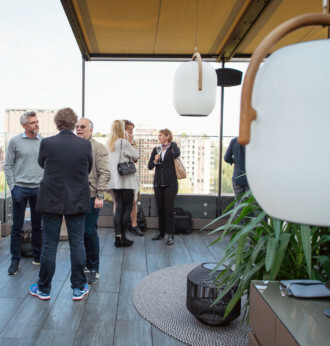 Gloster and Stylepark invited guests to the presentation of Cecilie Manz’s new Outdoor collection on the roof terrace of Hotel Il Duca – and it was a truly memorably evening.